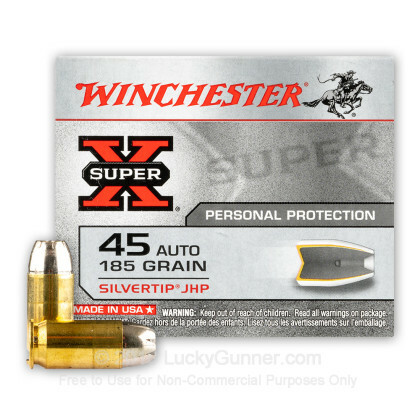 Winchester's Silvertip Super-X ammo was originally developed for law enforcement to replace traditional hollow point bullets offering a higher level of performance. 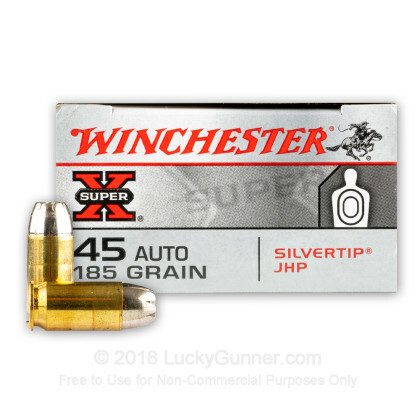 Silvertip ammo offers a unique combination of power, precision, reliable functioning, and on target performance with a specially designed jacketed hollow point bullet. 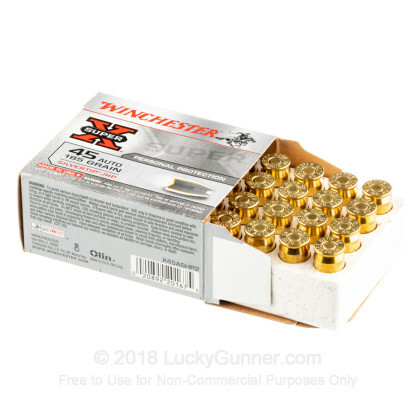 Manufactured by the legendary Winchester Ammunition Company, this product is brand new, boxer-primed, brass cased, non-corrosive, and reloadable. Back in the day--1982 or thereabouts--the Silvertip was the only defensive round available in .45 ACP that would dependably expand after passing through clothing. Federal's 185 and Speer's old cup-and-core 200gr "flying ashtray" were spotty in their expansion and the old 185gr Remington wouldn't deform at all unless it hit bone. 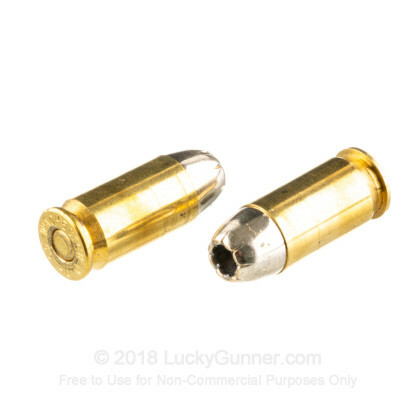 By modern standards, the Silvertip in .45 penetrated a bit on the short side when we compare it to the current standards, maybe around 10-11" in ballistic gelatin, a bit more if clothed, and not infrequently expanded to the size of a nickel. It also gave mediocre accuracy in most 1911s back then, though some guns were really really accurate with it. It was generally regarded as one of the rounds the least likely to go all the way through a bad guy and possibly endanger innocent bystanders, and some very knowledgeable court bailiffs used to carry it for duty in crowded courtrooms. All this is for the old, old aluminum-jacket version that they don't make any more. It wasn't perfect. There were occasional incidents of underpenetration with it back then, also, usually after it went through a car door or auto glass. And, back in the day, when most .45 ACP handguns were surplus 1911s, that might or might not have had ramp-and-throat work, and might or might not have magazines that held the top round at the higher angle that hollowpoints need to feed reliably in the 1911 design, some guns were a bit finicky about feeding the short stubby Silvertip, though the super-wide-mouth Federal and CCI were worse, and the old Remington 185 would feed in any handgun that would run with FMJ, it just probably wouldn't expand. Nowadays if you are using .45 ACP for self defense you are probably running a more modern handgun, and they tell us reliability is now a solved problem. 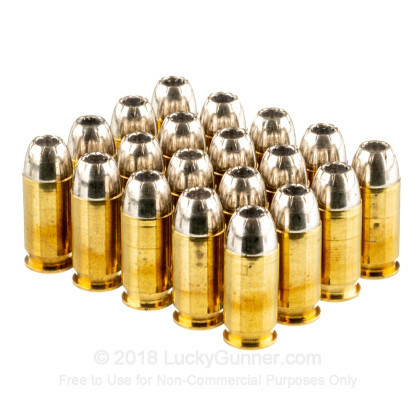 I have read that the new version, with its super shiny nickel plated copper jacketed bullets, was redesigned to comply with current standards. In bare gelatin it will penetrate generally 12" or a hair more on average, 13" or so through four layers of denim, expanding as much as .80" in bare gelatin, .65-70" in clothed gelatin. I have read of no accuracy tests with the new version. For what it's worth I have shot a box of twenty through my Gen 2 M&P and they all cycled and went where I put the front sight. In my opinion it's a good performer today. It will never perform as well as a bonded bullet through barriers like auto glass, but I sometimes think that's a criterion a little more important to the Highway Patrol than to the rest of us--and with changing fuel economy standards, you may have noticed that auto windshield glass and car door sheet metal have gotten a lot thinner in the past forty years, so maybe there's less of a difference than we think. It's not on the short-short list of absolute best performers, like the Federal HST or the Winchester T-Series, or the Speer Gold Dot. 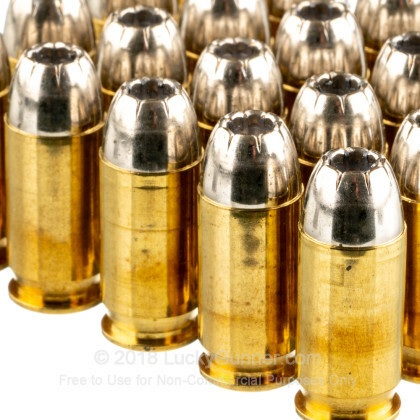 It won't replace 230gr Gold Dots as my preferred carry ammo in this caliber. But you could do an awful lot worse. With good bullet placement the bad guy is unlikely to be able to tell the difference.